Two journalists in an alternate future London meet the people from the outer planets - during one of the worst winters for cold and flooding that London has suffered. From political misdeeds to mushroom picking in a disused Tube station, Donal and Myron uncover all sorts of activities... and dangers. 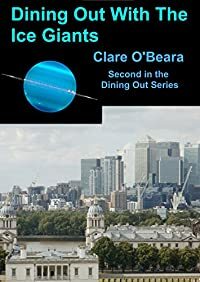 This is a standalone book in the series Dining Out Around The Solar System. This book is a standalone read and is followed by DINING OUT WITH THE GAS GIANTS.